"When you get a diagnosis, you gotta have a plan." COLUMBIA 10/26/11 (Beat Byte) -- "Ya did it, kid." On those four words, Michael Perry let a smile peek through and leaned forward and kissed my wife on her forehead. It was the end of an 18-month journey that started with a heart-sinking fear we had to confront immediately. Dr. Perry's wisdom -- delivered in brief, deliberated teachings, through a gentle-gruff demeanor -- started us conquering from the day we got the news. My wife had an aggressive breast cancer that doubled in size in weeks. It would kill her if we didn't act quickly. Steve Jobs waited nine months before he tackled cancer. He waited too long. But Steve Jobs didn't have Michael Perry. "When you get a diagnosis, you gotta have a plan," Dr. Perry told us on diagnosis day. And he already had the plan in his hand. Michael C. Perry, M.D., died Sunday, after leading a team at Ellis Fischel Cancer Center that saved my wife's life and saved or bettered the lives of countless others over the more than 35 years he spent transforming cancer -- from a life-threatening, hair-raising battle into a calm, deliberative management. Cancer isn't something to battle. You can lose battles. Cancer is something to manage. You can't lose a management. Loss was not part of Perry's plan. No doubt, his cool, poker-faced demeanor -- punctuated by a wry joke here and there -- was a major force guiding my wife and I as we faced this mortal foe. Dr. Perry never raised his voice nor betrayed pessimism; he never seemed the least bit worried; he avoided drama. He was attentive, compassionate, determined. He was graceful under pressure. Where Alison and I might have gotten lost in the fog of "hope and pray," Michael Perry saw through the fog, with an attitude more like "pray and know." Hope may spring eternal, but knowing is certain, and certainty -- or at least, a certain demeanor -- makes all the difference when you're facing the possibility of death. Dr. Perry was all about certainty. He didn't hope chemotherapy, and radiation, and surgery would work. He knew it would. As a patient and her husband and her children, we couldn't get any better than that. We started realizing the power of certainty after my wife's first examination out of chemotherapy, when Dr. Perry's nurse, Mary Johnson, measured the tumor and declared it "greatly reduced." We realized it with every follow-up visit, when we would hold our breath, keep our heads down, squeeze each other's hands and pray -- as Mary, or an oncology fellow, or Dr. Perry would palpate the danger zones, feeling around for any signs of tumor recurrence. When he sensed fear or worry, Dr. Perry would openly wonder what on Earth we were worried about. The cancer is gone -- he was certain. Nothing gives you courage to face the darkness like the certainty that light is at the end. 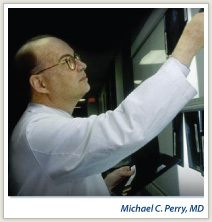 When the tumor vanished completely, not a trace to be found, we saw the light Dr. Perry had seen all along. For the last several months, we hadn't seen Dr. Perry at Ellis Fischel and between friends, everyone knew he was ailing. We wondered about ways to tell him how much he meant to us, but folks mostly agreed he didn't go in for that dramatic stuff, so we were left with the comfort that we had already told him, many times. Alison and I had another scare last month, and though we were in the finest hands, we missed our Rock of Gibraltar. The formerly tumorous area was acting all cancer again, hard and swollen, with every sign of breast carcinoma. It even looked suspicious on ultrasound. I spent most of the between time -- that time between surmising and knowing that cancer patients and families understand so well -- preparing for the worst. "It's back," I worried. "We'll deal with it, like we always have. But how do we tell the kids? Do we tell the kids? Okay, let's not tell the kids -- for now." Paul Dale, M.D. -- who didn't like what he saw, but wasn't overly concerned -- and David McNaul, M.D. got us right in, and had the thing biopsied at Ellis ASAP. Even though it looked, acted, and quacked like you know what, it wasn't cancer. I know what Dr. Perry would have said, after he found out how much we -- especially I -- had worried. I would have shaken his hand and stood there in the exam room -- drained and relieved. He'd have held my hand for an extra moment, and looked at me through that slight, almost mischievous smile. "Told ya so," he would have said. "Nothing to worry about. Now get out of here -- and go have a great weekend."